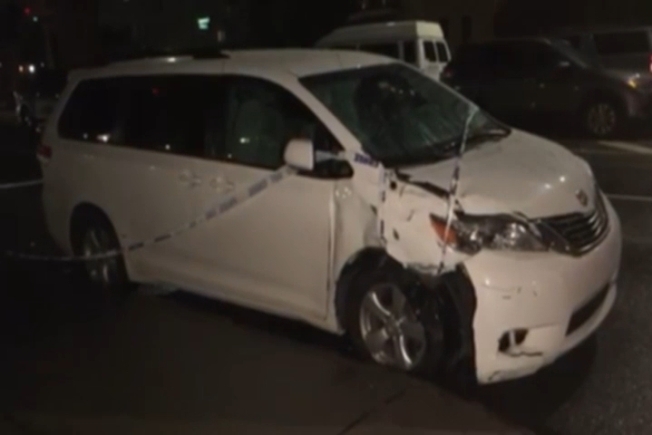 A van with damage near the scene of a hit and run in Sheepshead Bay. A minivan struck and killed a man who was trying to change a tire Saturday evening in Brooklyn, then drove off, police said. The 65-year-old victim was struck on 28th Street and Shore Parkway in Sheepshead Bay, police said. He was pronounced dead at Coney Island Hospital. The minivan with Pennsylvania plates was found abandoned a few blocks away with significant damage to the front, police said.